Our cedar raised bed planters are precision made in our factory and come to you pre-built. Each comes with one hang- rail and removable slats which allows for great flexibility. Why bend and kneel to plant? 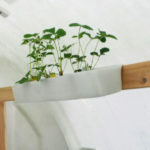 You can plant while comfortably standing or sitting with our raised planter. The deep bed allows plenty of room for your plants to grow. Plant in half or the full bed, use the removable slats as a work surface, or remove completely for full planting. 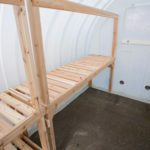 Cedar raised bed planters for the 12’medium size greenhouse are 5’10” in length, and those designed for the 7’6” and 15’ greenhouse are 86″ in length and 26” deep. A maximum of four work/raised bed planter tables fit into our medium and large greenhouses, where our small greenhouse will accommodate two 86″ tables. 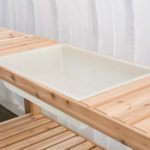 Our cedar raised bed planters are precision made in our factory and come to you pre-built. Each comes with one hang- rail and removable slats which allows for great flexibility. Why bend and kneel to plant? You can plant while comfortably standing or sitting with our raised planter. The deep bed allows plenty of room for your plants to grow. 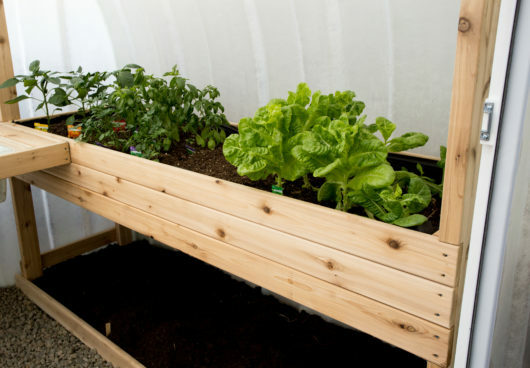 Plant in half or the full bed, use the removable slats as a work surface, or remove completely for full planting. 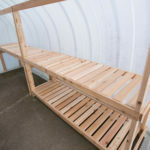 Cedar raised bed planters for the 12’medium size greenhouse are 68″ in length, and those designed for the 7’6” and 15’ greenhouse are 86″ in length and 26” deep. A maximum of four work/raised bed planter tables fit into our medium and large greenhouses, where our small greenhouse will accommodate two 86″ tables.